Toronto’s Daniels Waterfront — City of the Arts continues to roll along on the way to meeting completion target dates, and the April 21 announcement of the Artscape Daniels Launchpad is the latest step. 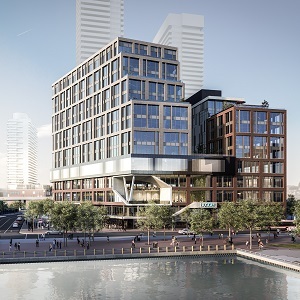 Rendering of the Daniels Waterfront South Precinct development, which will house the Artscape Daniels Launchpad hub on the Toronto waterfront. Artscape Daniels Launchpad will be a one-stop art and design entrepreneurship hub opening in the summer of 2018. It’s designed to provide affordable access to technology and tools of the trade and offer programming, services, funding and business opportunities. It’s named in recognition of the financial support of developer The Daniels Corporation and the John and Myrna Daniels Charitable Foundation and their leadership gift of $5.75 million. “We’ve got an awesome relationship between the two groups,” said The Daniels Corporation vice-president Don Pugh, pointing out existing Artscape relationships at Regent Park community cultural hub Daniels Spectrum and the Artscape Sandbox performance and event space at 301 Adelaide St. W.
Artscape’s head office will be located in the 30,000-square-foot Artscape Daniels Launchpad space on the fourth floor of Daniels Waterfront — City of the Arts’ mixed-use South Precinct development at the corner of Lower Jarvis Street and Queens Quay. Artscape Daniels Launchpad will also include: fully equipped membership-based production studios for digital design, audio-visual recording, textiles, prototyping, photography, jewelry, electronics and woodworking; a members’ collaboration commons; and flexible meeting and presentation spaces that will be available to rent. Artscape Daniels Launchpad will share the fourth-floor space with OCAD University’s Campus for the Connected World, while George Brown College School of Design will occupy two floors below. The Convergence Campaign, a hub for youth arts and culture non-profits The Remix Project and Manifesto, will also be neighbours. The South Precinct will also include: four levels of underground parking; 26,000 square feet of retail space at grade, primarily occupied by food services and a Royal Bank branch; the 10-storey East Tower, with 51 office suites, and the 13-floor West Tower, with 116 office units, that comprise 130 QQE Office Condominiums. The development is being built to LEED core and shell certification standards. RAW Design and Rafael + Bigauskas Architects are the architects, while Quadrangle is overseeing interior design. Occupancy is scheduled for the summer of 2018. The North Precinct of the 1.3-million-square-foot Daniels Waterfront — City of the Arts will feature: underground parking for its residential components; retail space at grade; 52,000 square feet of podium space that will likely go to another academic user; and two residential condo towers. The 516 units in the 45-storey Lighthouse West Tower are all sold well in advance of anticipated summer of 2019 occupancy. The 36-storey, 300-unit Lighthouse East Tower, featuring layouts ranging from studios to two-bedroom-plus-den suites, went on sale over the weekend. Move-in is expected in the fall or winter of 2019. “It was a good weekend and, although I haven’t seen all the numbers, there was a lot of activity,” Pugh said of the sales launch. “We’re right at the gateway to East Bayfront and right across from Sugar Beach. We’ve got an extension of Sugar Beach called Sugar Beach North done by the same architect that did Sugar Beach, Claude Cormier. It goes across Queen’s Quay and up beside Lower Jarvis.